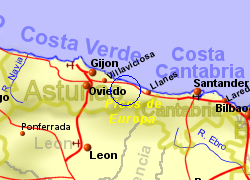 The small town of Arriondas, located 10km from the Costa Verde coastline of Asturias, and 15 km from the Picos de Europa National Park, lies in a large valley at the confluence of two rivers coming down from the mountains. This is an excellent location for exploring the area, walking canoeing or fishing, including salmon fishing. Kayaks and canoes can be rented in the area. 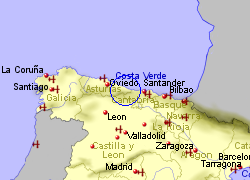 The town has a full range of facilities including a hospital. 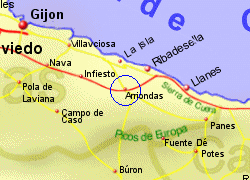 Map of the Arriondas area.